In 30 years, when todays 55 year olds are 85, three years in a nursing home will be a million dollars. 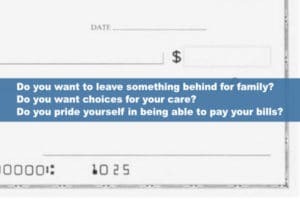 Which account will you write the first check from? If you could start a plan that gives you 2 million dollars for you and 2 million dollars for your spouse’s Long Term Care that costs $3500/year, would you be interested? Fifteen years ago a nursing home was $4500/month. Today it is $10,000 a month. In 30 years, when todays 55 year olds are 85, three years in a nursing home will be a million dollars. Which account will you write the first check from? You wouldn’t be without car or homeowners insurance. Long Term Care is far more expensive than most car accidents or homeowners claims, even if a tornado took the roof off. How do people deal with this? Currently, most people do not plan, end up broke very quickly, and apply for the welfare program called Medicaid. Unfortunately, if you are on Medicaid the chances are good nobody but a nursing home will accept you. The nice assisted living facilities that look like nice hotels lose money on the Medicaid reimbursements and often say no at the door if you cannot pay your own way. Thus the nursing home is a bit like debtors prison, it’s where you go if broke. Do you want to leave something behind for family? Do you want choices for your care? Do you pride yourself in being able to pay your bills? Unless you are very rich, you will not be happy when the time comes when you need help getting dressed and preparing breakfast, without insurance that pays for care in your home or assisted living facilities. LTC insurance pays for the care you want to keep you out of a nursing home. No matter what your financial situation, I can help you with advice that will cost you nothing. I’ll even pour the coffee. But if you want to prepare for the day when you need help, and do not want to go broke and search for a care provider, then you need to investigate LTC insurance. Call TheLongTermCareGuy.com at (920) 884-3030 and let’s schedule a chat.